Applying for a Social Security Card EASY and it’s FREE! • You must apply in person in order to obtain a Social Security number and our Social Security Registration Card. • If you need an original card (i.e. 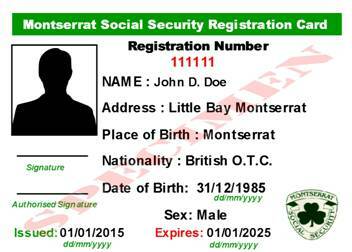 You were never assigned a Social Security number before), you must show proof of identity eg. – a valid passport or an original birth certificate along with a notarized photograph. Come in and visit our new offices today! We are located in the E. Karney Osborne Building in the birth of the new Town Centre, Little Bay.